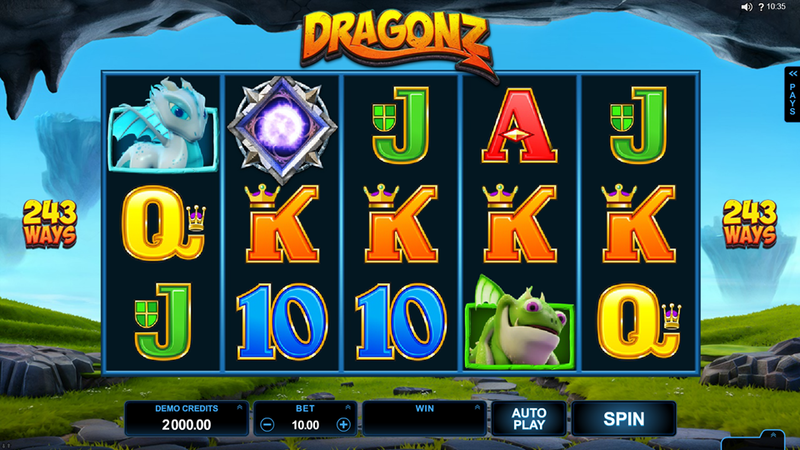 Dragonz is a visually-appealing video slot machine with 5 reels, 3 rows and 243 ways to win a non-progressive jackpot of up to 107.500 coins. Flint, Switch, Frost and Gobble are cute cartoon-like dragon characters that can activate the bonus rounds, get you some free spins and other rewards of which you can read more in the Dragonz slot review. Want to see how Dragonz works? Select a recommended casino site from the list below and start playing for free or real – our screenshots will give you a sneak peek! Form a winning combination with 3+ matching symbols on and note that Wilds and Scatters can trigger the rewarding features but also to bring a lot of coins: 3000 and 450 for 5 of the kind, respectively. The game also introduces the Wild Deal that can be activated after a non-winning spin. You will get a wild symbol on the reel 3 that will randomly distribute more extra wilds on the paytable to help you score a guaranteed big win. When collect 3+ scatters, you’ll get 10 free spins and a randomly activated round named after the game’s main characters. Along with a batch of free spins, Flint shoots the Flaming Wilds to increase the number of wilds on the reels, while Switch comes with Stashed Wilds and distribute them to help you score. The Frosty Dragon has Frosty Wilds and freezes existing wilds until you win with them, and finally Gobble spits the Winning Wilds and holds them for as long as you keep winning. As the Quickfire technology stands behind the game, mobile players can test it in the free play mode and run for real on their smartphones and tablets too. It’s not necessary to download any app. 3. What is the RTP factor of Dragonz? There is an average RTP of 96.30% that players got on the Microgaming-powered sites. Potential winners can place bets starting from €0.40 to €30 and wait for a few spins to land a thousand-coin jackpot. Innovation, originality and a lot of free games are the main features of this game surely able to attract both casual gamers and players looking for a big win. With a few tips you got here, there’s no doubt your odds for a massive jackpot will increase as you play.